Mauritania qualifed for the next round of the Africa Cup of Nations qualifiers as they beat Mauritius 2-0, to win the tie 3-0 on aggregate. Demba Sow and Moulaye Ahmed Khalil were the scorers on a rainy day in Curepipe. The visitors had the upper hand, having won their home leg 1-0, and dominated the game throughout with a host of chances. Mauritius were grateful to their goalkeeper Aboo Bakar Augustin who made at least four crucial saves. Augustin, though, could do nothing with Demba Sow's right foot firecracker from 20 yards after 38 minutes. The Mourabitounes continued to dominate in the second half and got their reward on the stroke of full-time. Despite a determined effort as well as the entrance of veteran Kersley Appou, Mauritius could not make an impact. Mauritania's second goal came frrom Ahmed Moulaye Khalil after defender Bruno Ravina made a mess of the clearance, with Khalil scoring from close range. 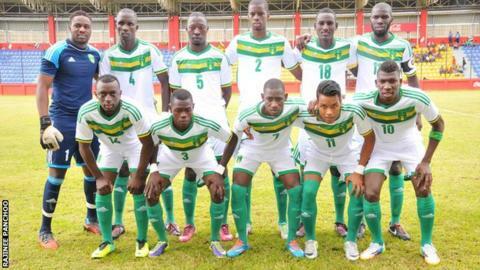 Mauritania coach Patrice Neveu said the tactics he put in place paid off. "We came to get the qualification and we knew we should not defend", he told BBC Sport. "We attacked from the start and we got the dividends. "We took this team of Mauritius seriously and they showed that they have the mental capabilities to come back. "Our aim now is to go to the group stage of the qualifiers. "We have a country and a team under construction, but a team who showed quality." Mauritian coach Akbar Patel felt the first goal killed the game. "This goal came on a bad moment as we were planning to start the second half and put all our weight in the battle", Patel said. "I will maintain that we need to be playing more than one international game every six months in order to progress. "But hats off to my players who in two weeks reached a level to challenge these players". Mauritania, who have never reached the Africa Cup of Nations finals, will join 27 nations in the draw for the next stage which will be played next month. Eventually seven countries will advance to join the 21 top-seeded sides in the group phase that will decide the qualifiers for the Nations Cup finals in Morocco next year.